THE devil IS NOT THE PROBLEM! You may ask, if the devil is not the problem, then is it GOD? NO! Man’s problem is not the devil, neither is man’s problem from GOD that created man. Man’s problem is basically from man himself. 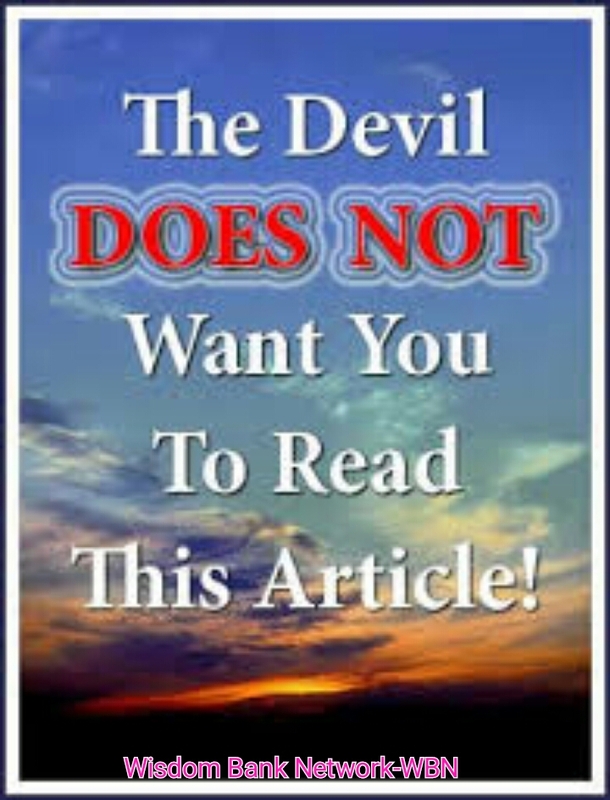 Please note, GOD does not do evil and does not try anybody with evil~James1:13. satan also have been judged(John16:11), so he does not have power to do anything to us. Do not also forget, that man have been given power over the devil, to trample upon him. So, it is absurd for man to accuse someone that he can trample on, as the one behind his problem. Every man’s problem is his thought. What man thinks in his heart is what automatically happens to him(Proverbs23:7), because the thoughts of man’s heart determines the spirit that will come to him. If man thinks good, The Holy Spirit comes to man, to counsel him on how to make his good thought manifest. In the same vein, if man thinks evil, the devil comes to him to advise him on how to make his evil thought manifest. So, every man is either victorious or ensnared by his thought. That’s how far we will go on Wisdom Bank today. But note; YOU HAVE BEEN GIVEN POWER OVER THE DEVIL, YOU HAVE THE POWER TO RESIST THE DEVIL AND HE WILL FLEE FROM YOU. THEREFORE, WHEN EVIL THOUGHTS BEGIN TO FLOW IN, RESIST IT AND IT WILL FLEE…BE WISE…!!! Next Next post: ARE YOU LIVING ACCORDING TO GOD’S PLAN FOR YOUR LIFE? DON’T COMPROMISE THE WORD FOR THE WORLD. evangelist chilavert… on WIRED FOR SUCCESS!